Q. Why can’t I open the book I downloaded to my laptop/desktop? First, make sure that you completed the installation of Adobe Digital Editions on your laptop or desktop. Adobe Digital Editions is required for offline reading, and is different than Adobe Reader. Perhaps you have downloaded the Adobe Digital Editions installer file but didn’t complete the installation process? Look and see if it is now fully installed and showing as an application on your computer. After you have confirmed this, double-click on the book file (ending in .acsm) and depending on your settings, it will either launch Adobe Digital Editions or ask you what program you would like to open it with (select Adobe Digital Editions). The first time you open a book (which has an .acsm extension) with ADE, you will be asked to "Authorize Your Computer". The ebook vendor showing by default is "Adobe ID"; do not modify this default. Note that you only need to enter an Adobe ID and password if you want to transfer the book to another device. 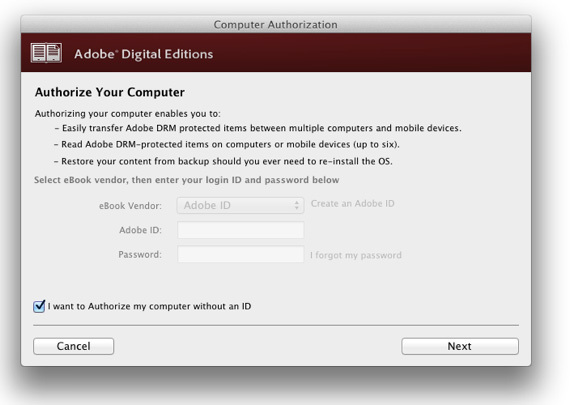 If you want to authorize your computer without an Adobe ID, check the box at the bottom left corner of the screen: "I want to Authorize my computer without an ID". If you can’t find the book, you can go back to Step 3 Download and download it again.